The show's environmental message is more relevant than ever, says the movie's producer. 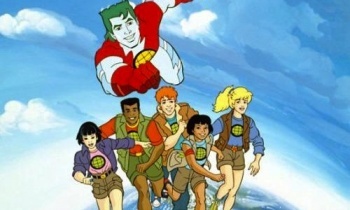 Eco-friendly kids show, Captain Planet is all set to make a comeback, more than twenty years after it was first broadcast. Cartoon Network has signed a deal with producers Don Murphy and Susan Montford, and their company Angry Filmworks, to bring a live-action version of the environmentally-themed superhero to the big screen. The original cartoon featured five kids - called the "Planeteers" - coming together to fight against pollution with magic rings imbued with the elements of Earth, Fire, Wind, Water, and Heart, and given to them by Gaia, the spirit of the Earth. If the Planeteers, who came from all over the world, encountered a threat they couldn't deal with by themselves, they could combine their powers and summon the titular Captain Planet. As you might imagine, he popped up a lot. The show had a rather colourful rogues gallery too, many of whom were metaphors. Hoggish Greedly represented over consumption, for example, while Duke Nukem - a different one - was a stand in for the problem of radioactive waste. The show first aired in 1990 and ran for six seasons. Murphy said that he was excited to bring the character back to life, and that the show's environmental message was even more pertinent than it was twenty years ago. He was confident that the movie could be both relevant and entertaining. Murphy's previous work has included movies like From Hell and the Transformers trilogy, and he and Montford produced the upcoming Hugh Jackman movie, Real Steel. I think that Murphy is right on the money when he says a movie with an environmental message is a good fit for modern audiences; climate change and renewable energy have been pretty big talking points in recent years. It's going to be interesting to see whether Murphy, Montford, and whatever creative team they assemble are able to keep the show's message of the world coming together to help preserve the environment without being hokey, or even worse, preachy.